Note: This post is the third in a series that seeks to summarize some of the clichés associated with religion. It is framed as a critique of a 1972 article by Ninian Smart. For the two first posts and a definition of cliché see here. Two theses: 1) Religion is a creation of the “present,” not the past. The conditions for the possibility of being “religious” are a product of “our” modern globalized and institutionalized world; 2) It is because of our contemporary technical world that it is even possible to view our past as religious, and the idea that our religious past or religious origins are the cause of our modern experience is created by these technical circumstances. These two theses are needed to counter the Janus-faced cliché which asserts that our religious past is the cause (or solution) to many of the world’s problems. From politicians who are hell bent on the never ceasing drive for “secular” freedom to self-proclaimed religious radicals who search brutally for a revival of an imagined kingdom, the past is repeatedly colonized in the name of an unseen justice. Full of sound and fury and signifying everything, the past is the space that both free-market capitalists and self-identifying religious adherents use to create the ideologies of the present. It is because of this cliché that modern discourse is stuck between a false binary: it either asserts that we are shrouded in a superstitious religious logic that needs to be eradicated, or it suggests that reason has given us a valueless world and we need to return to our religious roots. Critics of religion, for instance, claim that our religious past is merely an outdated cultural practice that needs to be rejected in favor of science or humanism. The claim here is often positivistic in nature, and portrays religion as an ancient way of knowing that needs to be surpassed by more refined forms of reason. Defenders of religion, on the contrary, appeal to our religious past to critique contemporary political culture. Sometimes these claims are purely territorial, as when a group of people appeal to a particular “sacred text” to justify land rights, and sometimes they are more revolutionary, as when a complete overhaul of contemporary society is prophesized in the name of a transcendent power, but in either case what is at work is what J.Z. Smith calls “an exercise of imagination” (Imagining Religion). The false binary of contemporary discourse is fueled by the mistaken assumption that history, not taxonomy, is what fuels the battles of the present. No cliché is more stupefying than that which describes Al-Qaeda as a throwback to medieval times. It is a by-product of globalisation. Its most distinctive feature – projecting a privatised form of organised violence worldwide – was impossible in the past. Equally, the belief that a new world can be hastened by spectacular acts of destruction is nowhere found in medieval times. Al-Qaida’s closest precursors are the revolutionary anarchists of late nineteenth-century Europe (Al-Qaeda and What It Means to Be Modern). Only in the modern world is it possible to declare a global religious war against the evils of capitalism. As Slavoj Zizek notes, the battle between Western liberalism and Islamic extremism is not a war between ancient religious Jihad and the modern MacWorld, but MacWorld versus MacJihad (Welcome to the Desert of the Real). What lies at the core of the idea that our religious past informs the present is the mistaken assumption that history is a singular, linear, and chronological progression of events. This assumption is built on the idea that history is out there, waiting to be discovered, and that it is independent of the material, intellectual, and technical conditions that render viewing history possible in the first place. The conditions for the possibility of being religious are excribed by the very writing of history, not its actual reality. As Jean-Luc Nancy notes, “to be present in history and to history (to make judgments, decisions, choices in terms of a future) is never to be present to oneself as historic. It is to be “spaced”—or to be written—by the spacing of time itself, by the spacing that opens the possibility of history and of community” (Birth to Presence). Or, to summarize Bernard Stiegler’s argument in Technics and Time, the meaning of our shared history is inseparable from the technē that facilitates such questioning—”the human” is a technical creation. The tools and ideas we have available to extract, shape, and organize the world around us are the formative element in the construction of history, not the chronological progression of past events, which are never singular anyway. All this, of course, is simply to affirm that religion has never been anything but a reflection of the “present.” The question of religion cannot be abstracted from the technical world in which we dwell. 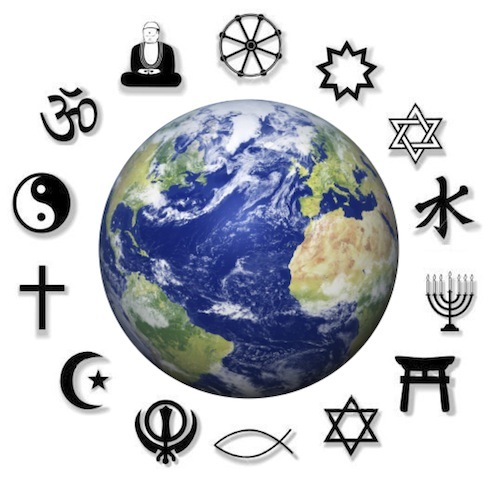 It is the modern globalized world and all the institutional components it supports (this blog included) that make viewing religion possible at all. Modern technology and taxonomy is what presents the patency of religious discourse, not the religious past, no matter how objectively this past may be romanticized. This entry was posted in Tenzan Eaghll and tagged Al Qaeda, Bernard Stiegler, ISIS, J.Z. Smith, Jean-Luc Nancy, John Gray, Ninian Smart, Slavoj Žižek, Welcome to the Desert of the Real. Bookmark the permalink.